Anyway :]. I am very excited to be back in the hobby that is remote control cars, I love how my time just flies by as I do random stuff with or to my car lol. 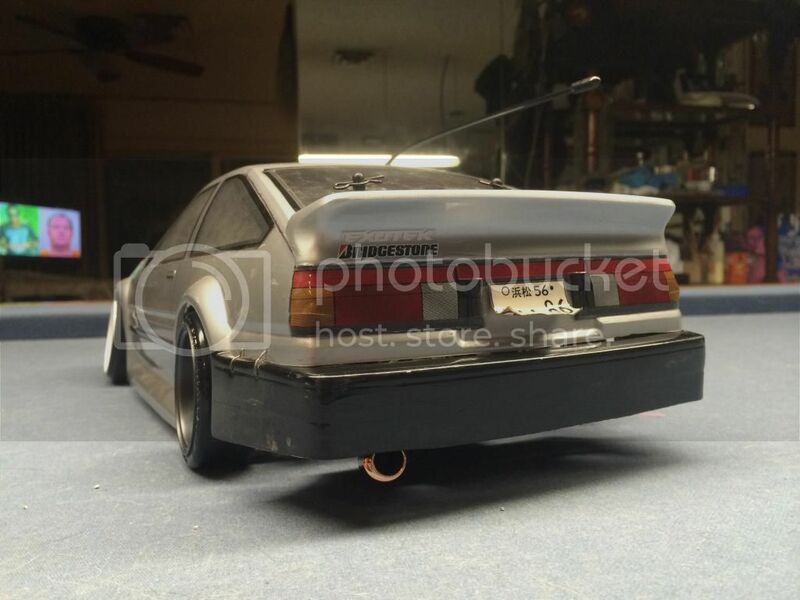 When I first started looking for a new car I was not looking for a drift specific car thinking all I needed was some simple stuff to make it slide nicely. Though I am still learning I figured for an all wheel drive car I would need a locked rear, an open front diff of some sort, some adjustable suspension parts, and drift tires. I found the Sprint 2 offered me what I was looking for in adjustable suspension out of the box, and it was very available, plus they offered it with the Falken Porsche. Though I had been looking into a new car for a few years, I kept pushing it off, finally my brother came across a deal on exactly what I had been looking at and picked it up as a Christmas gift for me. 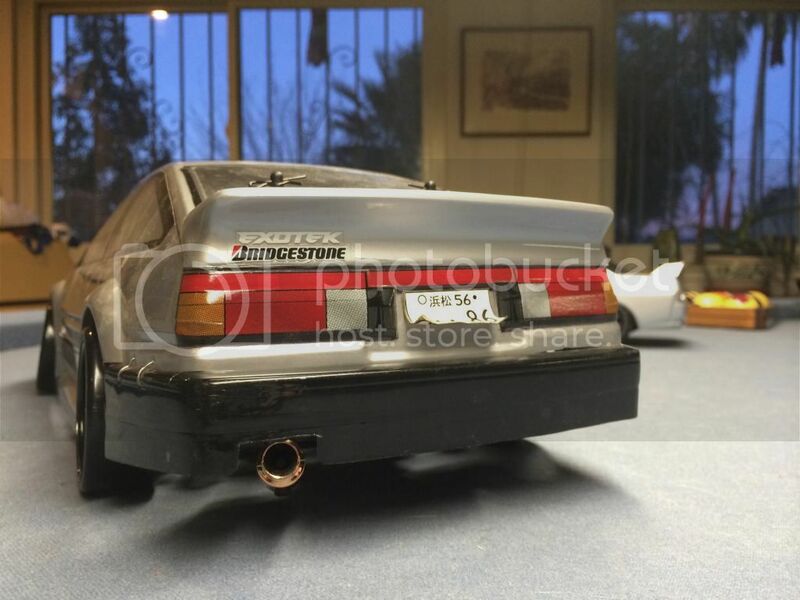 Once receiving my neat little car I began to research making kit drift proper, only to find that most dislike the car for drifting because of the weight layout and that its 50/50 gearing. I agree with not liking the gearing right now, but the weight isn't to bad. Overall I would suggest an MST RTR over this any day now, but since I have it I let my self get carried away in buying cheap upgrades, plus replacing the stock stuff that broke almost instantly out the box. I would have only bought the front 1 way if I didn't find that after a few runs a good amount of screws had fallen out of the chassis... 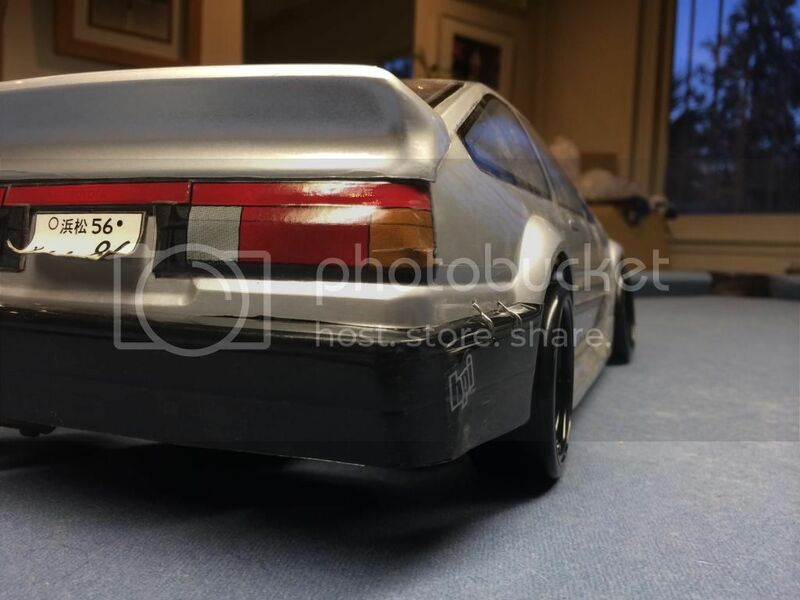 Which honestly, I think to make this car drift really good out the box, lock the rear and play with the ESC settings a bit till you find a setting your comfortable with, and adjust the front camber and toe. 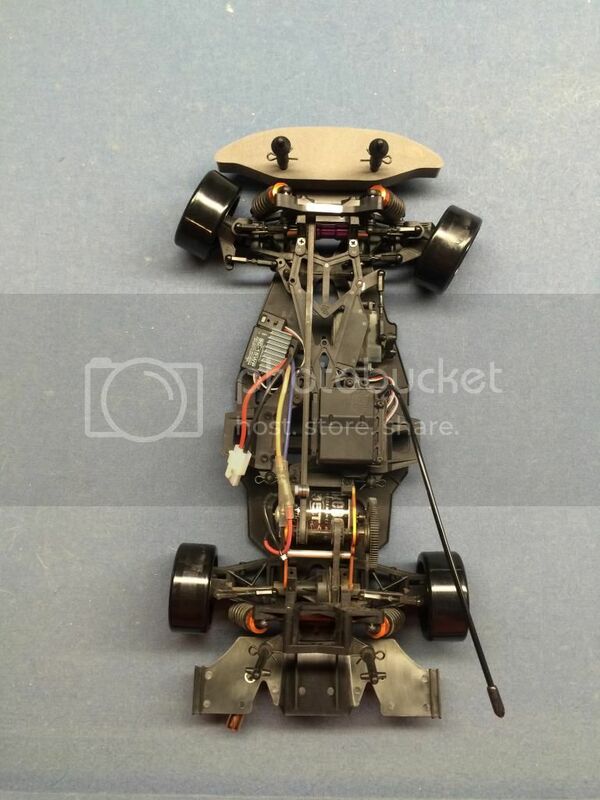 If you want to get competitive with rc drifting, I can see this needing a lot of work... I also have not drove my car since the shiny upgrades, and maybe it will make a nice difference. It started as a new stock Sprint 2 sport with the Falken Porsche. I had everything sitting around before I started trying parts one at a time. I started with the front 1-way, and though it does help a little, I do believe a locked rear and the stock front would be much better than stock rear with the 1-way. Next was a front alignment, which also made a good difference, but still did not allow me to do what I wanted with the car. So next I attempted to lock my rear diff using body clips like a video I saw on youtube... I used clips off a tamiya, and they were WAAAAY to small, so I got a few good slides in before it failed and had it locking on and off. LOOOK AT MY PAGE OF JIBBER JABBER ABOUT THIS CAR!! GEEEEEZ IM SO SORRY IF YOU GOT BORED READING THAT!!! 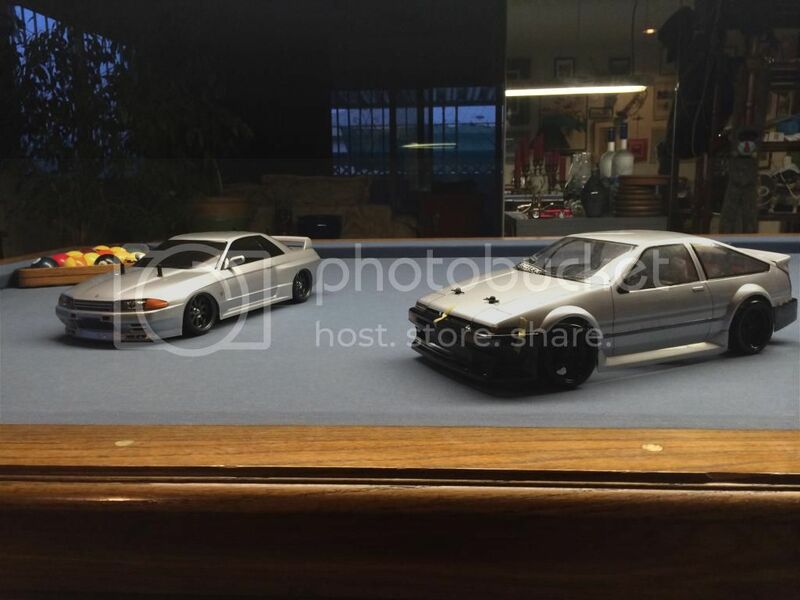 So here are pics of the shiny toy car I have :]. I can not wait to get an MST or Sakura now. 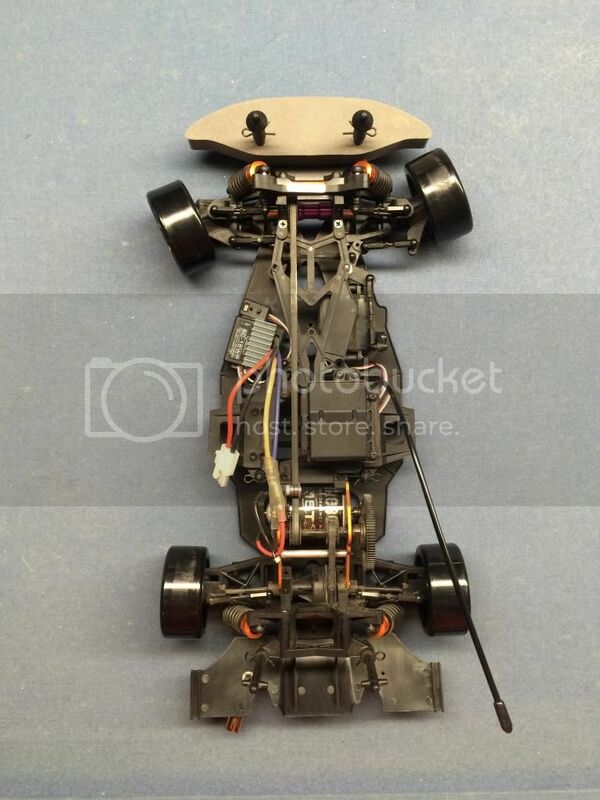 After those pics were taken I put my HPI wheels back on and took it out for a test drive. The camber makes so much difference, the car is instantly more controllable while turning. After feeling a nice improvement here I decided to lock my diff doing what I saw online, not know I used the wrong size body clips. With the locked rear control becomes ALMOST perfect! But after maybe 4 figure 8s around some bottles the diff unlocked and the car ran like before. I did not want to fix the diff only to take the car apart again when I was ready to rebuild it with the other parts I had collected, so it was time. ANNNNDD NEW STEERING ANGLE !!! ... The control arms and steering knuckles are GPM from Asiatees. They look nice, and provide a tiny bit more angle. I may add more toe out to try and get just a little more angle while at lock. Car is looking great. Did you do anything about re-locking the rear diff? 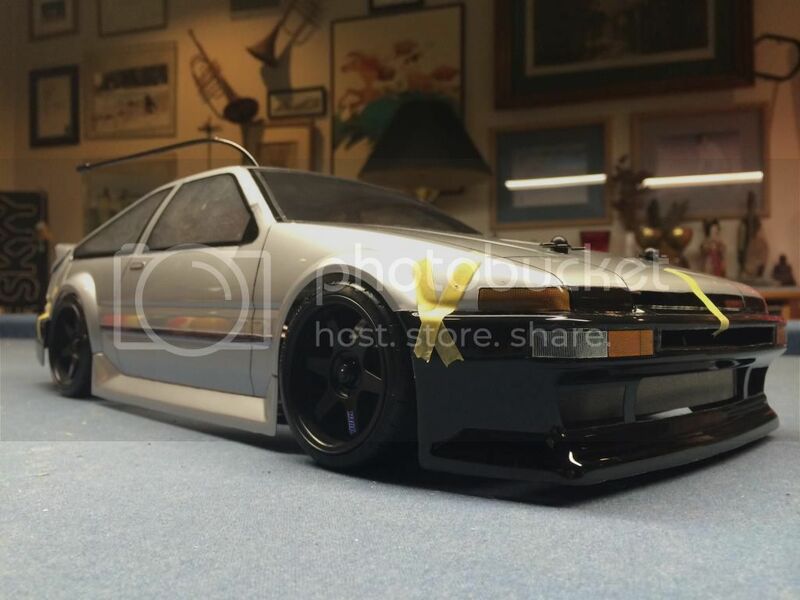 Currently in the diff now is still much like the youtube video of using the boy clips, except this time I have used the stock HPI clips off the car as well as a couple small Tamiya clips just to let my mind think its better off with more than less. I am super anxious to try it, there is less play in between the rear wheels this time so that makes me think it is a stronger lock. I tried the body clip method of locking the rear S2 diff using the stock S2 body clips but couldn't fit 4 in there, only 3. then I move to a smaller set I got from Axial I think, and those were too loose so I used clear silicone an it's locked nice and tight. 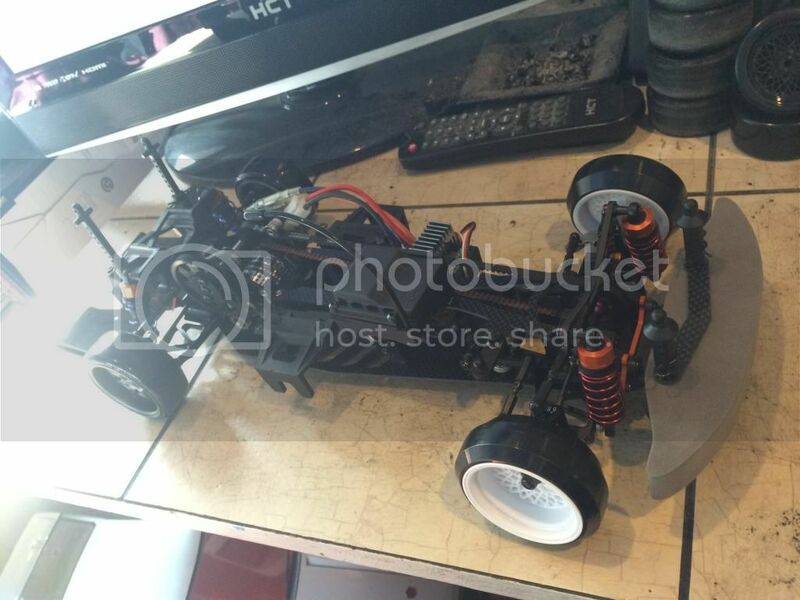 is that the Exotek carbon chassis kit? 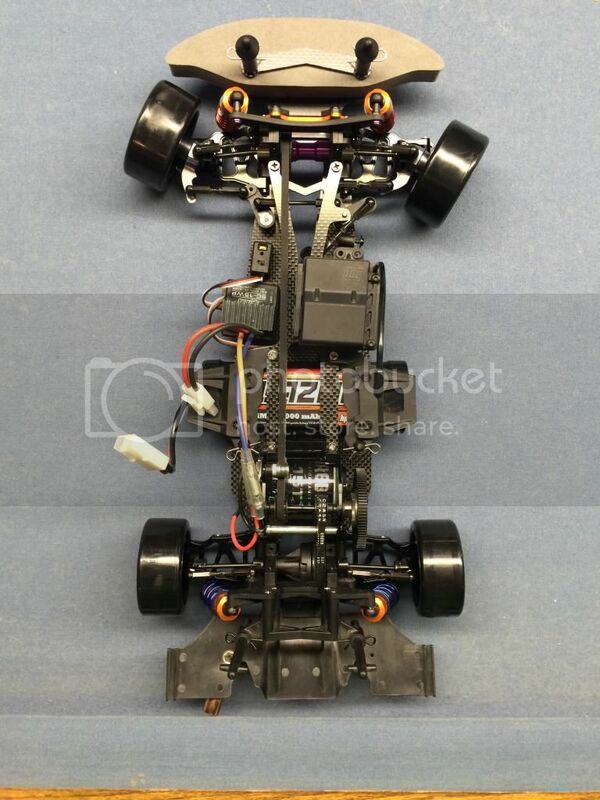 And yes it is the Exotek chassis kit, that is one other think I forgot to mention lol. 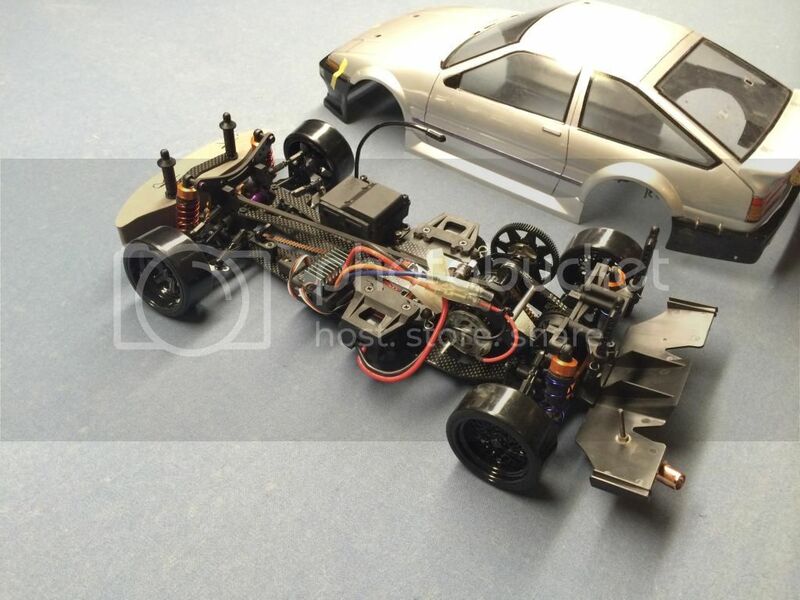 I found it for a really good deal, but afterwards found the HPI graphite chassis is still cheaper... 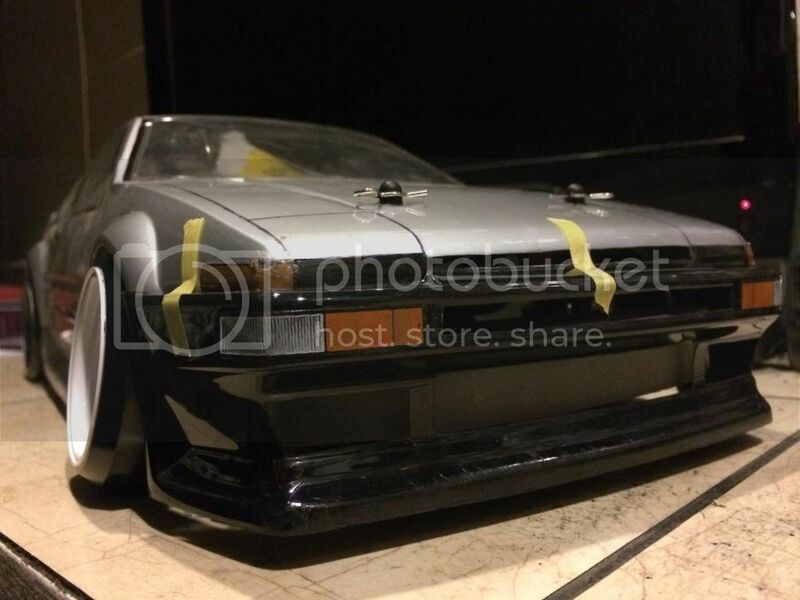 But this is not as wide as the HPI graphite so I think that makes it look better, and I am happy with it for the price I got it for lol. I am trying to think of what else I forgot about the chassis now lol. MY CHEAP SPRINGS! Topcad springs from Asiatees, like 4 bucks for a pack of 5 different pairs. 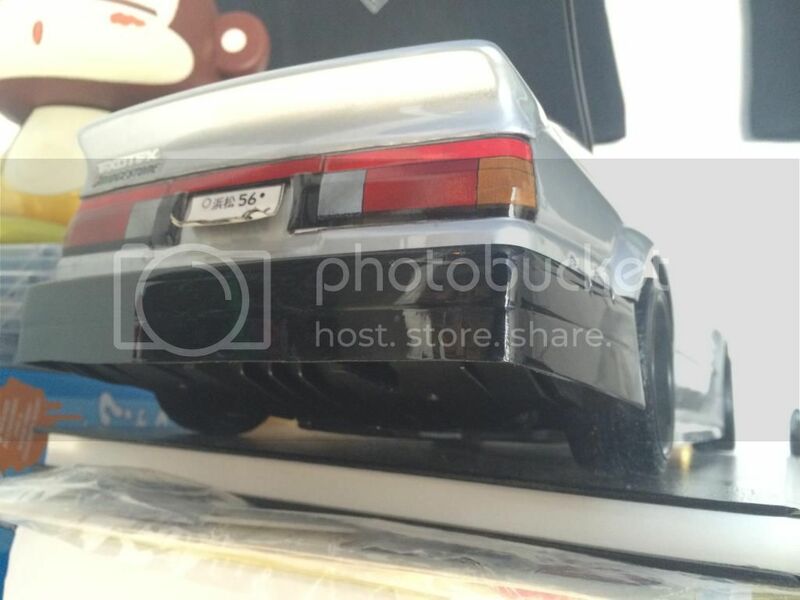 the exhaust is also cheap stuff from Asiatees. OH and the Tough Racing belts off ebay. The rear seems to fit a lot tighter than the stock, and the front didn't need as much tension from the pulley to feel nice and snug, but we will see how those do when I drive it. 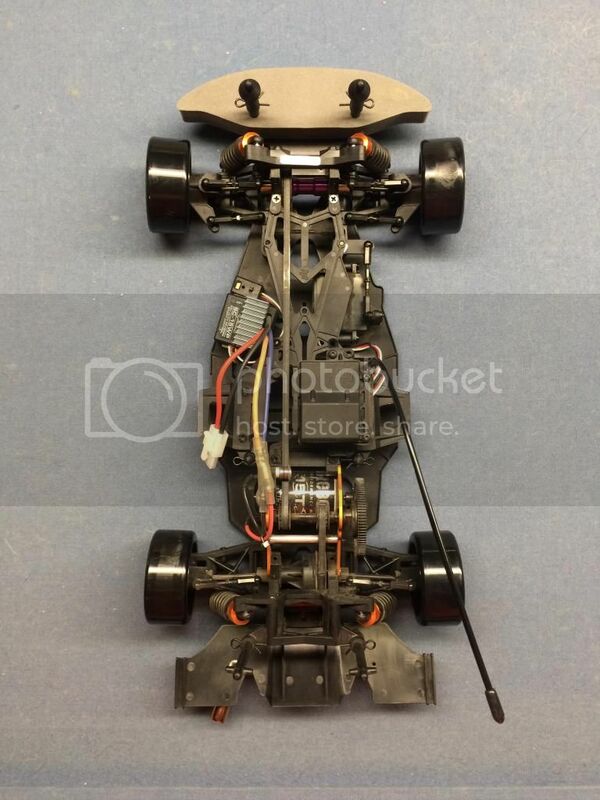 So I have been looking at my car thinking I can use a second front HPI graphite shock tower for the rear and make adjustments to make it work. 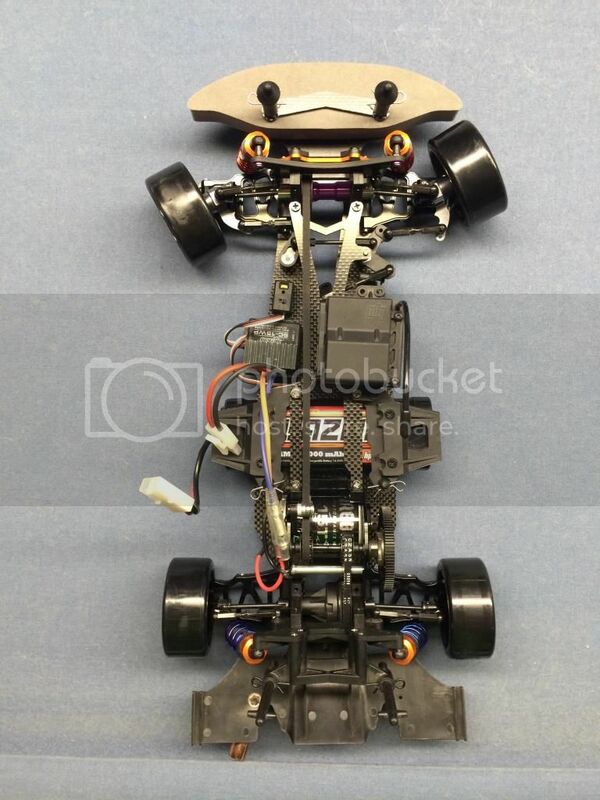 The front one changed my camber a bit to where the axles are now sliding out at the right angle. I am glad I caught this before running the car lol. I may just try more o rings to keep the axle from sliding in to the diff far enough for it to fall out of the knuckle, or I may adjust the camber again. The camber seems really nice though and I almost get the wheel flat in full lock so I don't see adjusting the camber again, so I will probably find o rings before I have it running again. I'm almost positive you'll be able to modify the front carbon shock tower to work on the rear with a little Dremel/drill work. Good news is, tower hobbies just dropped the price of the front carbon shock tower by $7. if you can't get it to work quite right, it's only $16 down the drain instead of $23. Its funny you mention that, I saw that earlier and it makes me so much more tempted to give it a shot. I got my first one for 12 shipped off ebay, but part of me thinks its bootleg lol, it seems to line up properly, but was not pre beveled? (not sure if thats the right word lol) for the screws. I put it on anyway figuring it won't hurt lol. Front axle problem solved with the use of some rubber spacers made from old rc rubber tires. Also by playing with the rear end enough with my hand I have started to loosen the body clips that lock the diff. It still seems to be holding up, but there is a good amount of slop in it now that I assume will only get worse. If I do this front shock tower thing for the rear before I get that servo then I will fill the diff up with silicon or something to lock it properly while the rear is semi apart. This looks Amazing!!! Very cool.